Coulscott’s white Georgian manor and original farmhouse peak through the trees in a lovely leafy valley near the North Devon coast but closer inspection reveals an exclusive hamlet of stunning holiday cottages and fantastic family facilities. Indoors and out, children and grown-ups alike are spoiled rotten, staying in the lap of luxury and having so many ways to while away the days without leaving the glorious 12 acres of grounds. There are 6 properties at Coulscott, comprising Georgian House, Old Farmhouse, The Old Barn and three cosy cottages created from the old farm buildings. All of them have been designed and furnished to stunning standards which would be perfectly placed in the pages of swish interiors magazines. 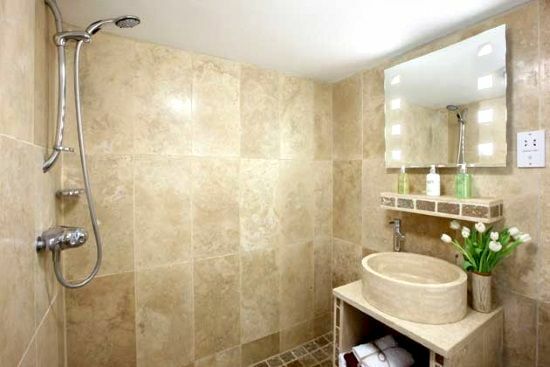 From magnificent galleried living rooms to sumptuous period elegance, Travertine tiled bathrooms and four poster beds, all the properties provide somewhere special for families and of course they come with all the baby and toddler essentials as well. The home entertainment is bang up to date, including Apple TV’s, Netflix, Sky free view, DVD players and unlimited WiFi. If parents can’t be bothered to cook, a wide range of frozen ready meals from ‘COOK’ are available to buy from the courtyard freezer, along with delicious local ice cream. What’s especially great about Coulscott for families are the superb facilities that will keep everyone happy whatever the weather. The lovely indoor pool is kept at a toasty 30 degrees and has great views through big barn windows, with seats around the side to kick back with a book. 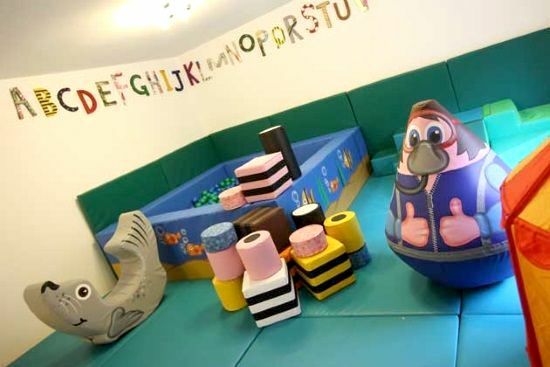 An adjoining games room includes table tennis and table football, whilst babies and toddlers have their own soft play room, with a ball pool and giant Liquorice Allsorts! 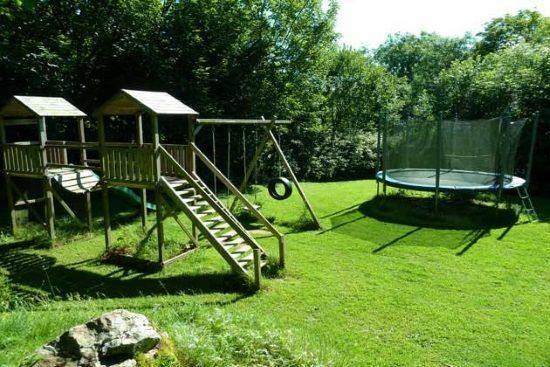 There are acres of garden and grounds for children to play hide and seek, have picnics by a stream or build dens in the woods, plus a new outdoor play area includes a wooden pirate ship, 2-storey Wendy House, adventure climbing frame and swings, custom made tractor with a slide, turf labyrinth and a large, netted trampoline. Children may well meet a peacock strutting around the garden and will be delighted to get acquainted with the Coulscott menagerie of hens and ducks, alpacas, pygmy goats, micro pigs and Matilda the wallaby. Other wildlife are regular visitors to Coulscott, including owls, foxes and badgers who might just make an appearance in the dusky twilight. Coulscott comprises 5-bedroom Georgian House, 5-bedroom Old Barn, 3-bedroom Old Farmhouse, 2 bedroom Peacock and Aylesbury Cottages and 1-bedroom Bantum Cottage, all set in 12 acres of gardens and grounds with an indoor pool, adventure play area and friendly animals. 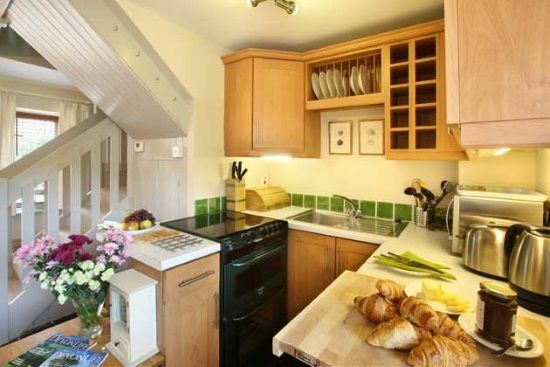 Bantum Cottage (sleeps 2 + 1 baby in a cot), with its 4-star gold award from Visit England, may be bijou and boutique but is bursting with style and luxury. Striking feature walls give the open plan living/dining area a touch of class and there’s a cosy corner sofa, Sky freeview TV with Netflix and a DVD player. 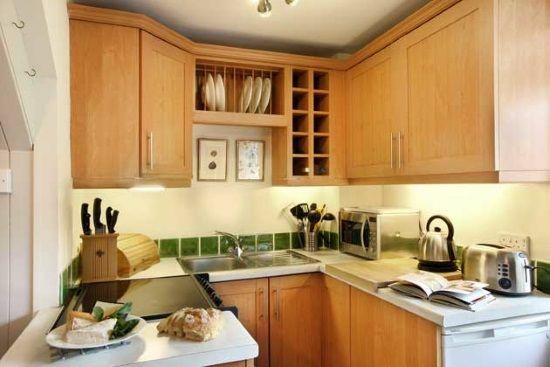 The compact little kitchen is modern and well equipped, including a microwave and handblender for whizzing up baby food. 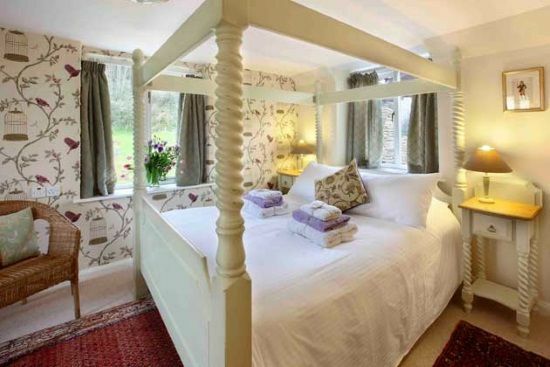 Upstairs there’s a little cot room and bedroom with a romantic king size 4-poster and ensuite marble wet room. Bantum Cottage has a bistro table in the courtyard. 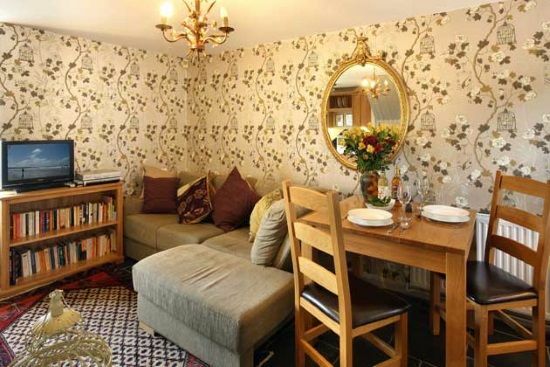 When Peacock, Aylesbury and Bantum Cottages are booked together dining facilities are available for 10 people. 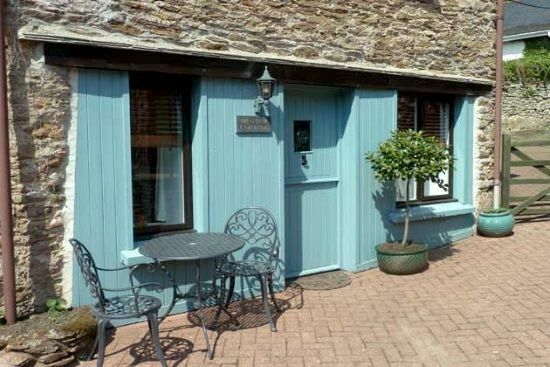 Coulscott has a best-of-both-worlds location, being in an Area of Outstanding Natural Beauty on the edge of the Exmoor National Park and just a couple of miles from the North Devon Coast. The cottages have a secluded valley all to themselves and are set in 12 acres of enclosed gardens and grounds including woodland, streams and ponds in the owners’ animal enclosures. Combe Martin, which has England’s longest High Street leading to a sheltered beach, is just over a mile away for all the necessities, including minimarkets, a bakery, Boots pharmacy, the ‘Top Chippy’, family friendly pubs and a choice of places to eat. Tesco and Sainburys in Barnstaple will also both deliver to Coulscott, as will Besshill farmshop (10 mins), which sells home reared meats, local vegetables, fruit, preserves and cheese. There are plenty of beautiful beaches and coves within easy reach of Coulscott, including nearby Hele Bay, the 3-mile long Saunton Sands, backed by dunes, and the spectacular Woolacombe Bay. Families who love the great outdoors also have the wild beauty of Exmoor only half a mile from Coulscott’s gates. The national park boasts England’s highest sea cliffs and over 700 miles of paths and tracks to explore the heathery moors, wooded ‘coombes’, pretty coves and unspoilt villages like Parracombe, with its traditional country inn, The Fox and Goose. Exmoor also has plenty of wildlife to keep eyes peeled for including wild ponies, red deer and birds of prey. North Devon has a host of family attractions, starting with Combe Martin Dinosaur and wildlife Park just across the valley. Children can have close encounters with animatronic dinosaurs and ride the Dino Train then see all kinds of animals from lions, primates and wolves to penguins, meerkats and otters. There’s also a 7,500 sq ft indoor soft play centre opening Easter 2015 with slides, tubes, scramble nets, rope bridges, ball pools and more to keep kids busy while parents have time for a coffee. Other favourite family days out include The Big Sheep working farm and adventure park at Abbotsham, The Milky Way amusement park near Bideford, Lynton’s picturesque narrow gauge railway and Watermouth Castle and Theme Park at Ilfracombe. While in Ilfracombe, 11 The Quay is Damian Hirst’s restaurant, with great views, fab fish specialities and of course plenty of original artwork. Nearest Medical Services: GP in Combe Martin. Bristol is just under two hours away. Sandy beaches are under 5 minutes drive away. Combe Martin has a long high-street with plenty of shops and restaurants. Shared indoor heated pool on site. Soft play barn and a ball pit. 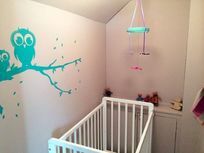 Wooden Maria Saplings cot, most are the large folding, 2 are the compact ones ( in the 1 bedroom cottage),standard travel cot is available, high chairs, booster seats, baby bath, bathroom step, some plug sockets protectors, stair gates, plastic plates and cutlery and cups and food blenders. Netflix, U rated DVDs, books and games. COOK meals can be arranged by prior request. 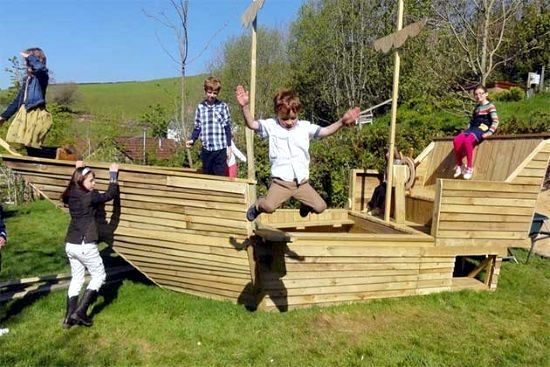 Adventure climbing frame with sandpit, slide and swings, custom made 2 storey Wendy House, custom made large pirate ship with huge sand pit, custom made large tractor with slide, large trampoline, labyrinth cut into the hillside. Private garden with BBQ and dining area. Dedicated recycling area, solar panels on the pool, energy efficient bulb, good insulation, own copiced wood provided for the wood burners, wild areas in the grounds, own water from bore hole has no chemicals. Dogs can be allowed by prior request and for Peacock they are charged at £25. Alpacas, mini pigs, pygmy goats, ducks, chickens, peacocks, wallaby and a dog. Multiple cots and highchairs available. 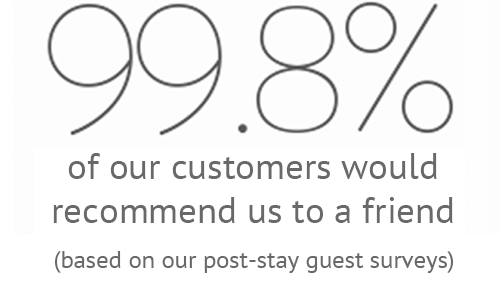 We were made to feel extremely welcome on our day of arrival, the property was lovely and had stair gates, a cot, high chair and a baby bath which is extremely helpful being as you have to carry around a small suitcase of baby equipment when you have a child! activities where great for my Son, Pool was nice and warm, soft play was a great idea, optional meals is a nice touch. environment was very relaxing and needed. Beatifull cottage. Very quiet location...all you can hear is the stream trickling and birds singing. Facilities are great both indoor and outdoor. Fantastic spaces for young children to let off steam in a safe and very clean environment! Only one negative...Floorboards in the cottage are a little creeky as is the bed!! 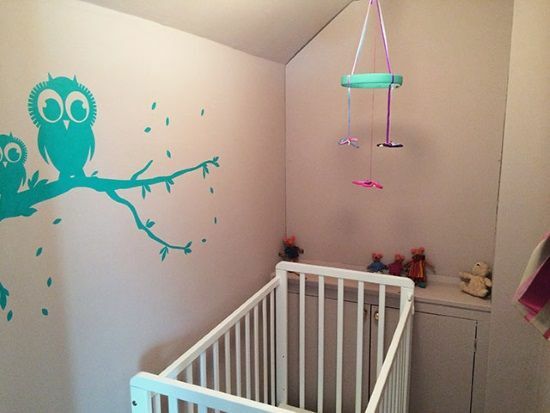 Could be a problem if, like us, your baby/toddler is a light sleeper!